Earl Melchert did not plan to be home on the afternoon of Sept. 5. He was supposed to be at work managing a fertilizer plant in a town in western Minnesota. He returned briefly because he had forgotten a diesel can that he had wanted to fill on his way home, so he could mow the grass that evening. As he prepared to head back to work in Elbow Lake, Minn., about 150 miles northwest of Minneapolis, he looked out his window and saw something moving in his field about a half-mile away. “I thought at first it was a deer,” Mr. Melchert, 65, said in an interview on Saturday. What he saw, it turned out, was 15-year-old Jasmine Block, who had disappeared on Aug. 8 from her home in Alexandria, Minn., about 30 miles from Mr. Melchert’s home. She had escaped from a nearby abandoned house, where three men who abducted her had kept her for the previous few days. After knocking on the doors of several homes and not getting any responses, she swam across the lake near Mr. Melchert’s property to get to his house. The details of Ms. Block’s ordeal emerged soon after: She had been at home alone when she encountered Thomas Barker, 32, outside her house. He told her he needed help with a family situation, Richard Wyffels, the Alexandria police chief, said at a news conference. Mr. Barker was a family acquaintance, Chief Wyffels said, so Ms. Block agreed to accompany him in his car. When the two arrived at Mr. Barker’s house, he restrained Ms. Block with zip ties, and for the next 29 days, Mr. Barker and two other men, Joshua Holby, 31, and Steven Powers, 20, sexually and physically assaulted her and threatened her with weapons, the police said. They moved her several times, ending near Mr. Melchert’s property. On Sept. 5, the men went to get food, leaving her alone for the first time. Shaken as she was after her escape, she was still able to help the police find her kidnappers. Just as officers arrived at Mr. Melchert’s property, a car drove by — one that Ms. Block recognized. It belonged to Mr. Powers. She identified the car for the police, who arrested him, Chief Wyffels said. The two other men were arrested soon after. On Friday, the Alexandria Police Department presented Mr. Melchert with a $7,000 reward that had been offered for information leading to Ms. Block’s return; $2,000 had come from Ms. Block’s family and $5,000 from an anonymous donor. Mr. Melchert said he knew exactly what to do with the check: He gave it to Ms. Block. “It’s the best thing I’ve ever done,” said Mr. Melchert, who went to dinner with Ms. Block, her mother, her two sisters and her aunts after the presentation on Friday. 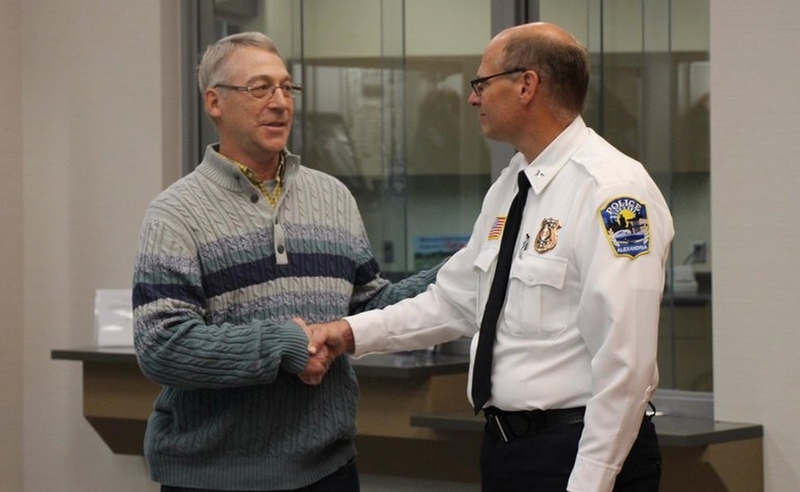 On the Alexandria Police Department’s Facebook page, Chief Wyffels praised Mr. Melchert’s kindness and generosity. “Thank you, Earl, it is people like you that make this world a better place,” he wrote. The attention has been overwhelming for Mr. Melchert, a self-described country boy. He and his wife have read the praise on social media, where some people have called on him to run for president. He has no such plans, however: He retired last week.